Timor-Leste, the world’s newest country, has an old problem—how to transform a subsistence farming system into a modern, market-based economy. The 3-year-old Pacific nation also known as East Timor is emerging from nearly four centuries of colonialism, revolution and invasion, and the University of Hawaiʻi at Mānoa College of Tropical Agriculture and Human Resources is there to help. The college’s Collaborative Research Support Program is drawing on its experience in Latin America, Asia and Africa and a $2.4 million U.S. Agency for International Development grant. The mission is three-fold: increase production and food security, create jobs and boost household income and introduce best practices to prevent erosion and land degradation. "We’re the dermatologists of the environment," says Goro Uehara, soil scientist and principal investigator for the East Timor project. "We manage soil, the skin of the earth, for agricultural and environmental well being." With the Timor-Leste Ministry of Agriculture, Forestry and Fisheries, he trains officials how to diagnose and treat soil deficiencies. CTAHR colleagues bring additional expertise in aquaculture, tropical crops, livestock, integrated pest management and even geology. Coming from an island state, where transportation expenses limit competitiveness, UH faculty also explain the value of niche markets. Take coffee for example. With U.S. assistance, Timor-Leste sold 70 percent of its certified organic beans to Starbucks. But because they sold on the commodities market, the country received barely a fourth of the income of Kona coffee growers despite supplying four times as many beans. The country’s abundant kiawe trees could support boutique honey. The indigenous black rice found favor with a Waikoloa chef for a crunchy, nutty salad. "Value added" products promote a sustainable economy, Uehara adds. Indonesians eat kukui nuts, but at a low of 30 cents per kilogram selling price, collecting the wild nuts isn’t worth the labor involved. Hawaiʻi firm Oils of Aloha, which extracts kukui oil for niche cosmetic products, is willing to buy the nuts for 50 cents per kilogram. What the UH team won’t do is dictate what plants should be grown, like so many plantation managers from the nation’s colonial past. "We have to understand their priorities to bring about change," says Uehara. Harold McArthur contributes an anthropologist’s approach—understanding the fabric of the culture, identifying farmers’ needs and preferences and involving women’s groups and schools. McArthur, in turn, credits the work of project field marshal Andre du Toit. 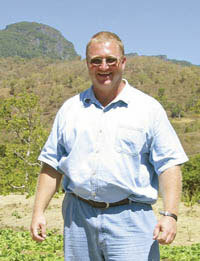 The South African agronomist moved to the Baucau district watershed with wife Carin, who served as project office manager, and their two children. An internationally respected academic who never lost touch with his farm-boy roots, du Toit applied a practical, people-oriented approach. Local farmers identified a problem, such as chromoleana, an aggressive field-usurping weed impervious to cutting or burning and unpalatable to cattle. Du Toit helped them test a possible solution: composting the nitrogen-rich weed in trenches to become green manure for growing tomatoes. In varying ecological zones from ridge top to the sea, du Toit worked with Timorese communities on projects including fish farms, water-efficient vegetable gardens, road-side markets and pig and chicken operations. "Du Toit hit it off with the community from day one," says McArthur. His death in an accidental electrocution early this year was a major setback to the program and the profession. Still, the extensive groundwork he laid in just one year propelled a project that was always intended to outlast its advisers. "We need more people like Andre. We need to train students to be like him," Uehara reflects. He takes hope in watching the next generation already at work. Mānoa master’s degree alumni Jose Ximenes, Rui de Jesus, Brigida da Silva and Jesuina Gomez Nina have returned home to help their nation move ahead. UH students from Timor-Leste serve summer internships on projects in the country. 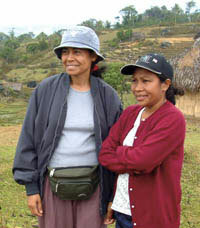 UH faculty on official trips to the National University in Timor volunteer at an agriculture-oriented high school as well. "Sometimes people wonder why we get involved in such work," says Uehara. The science is applicable elsewhere, of course. But mostly, he says, "it’s because we have a great faculty more interested in psychological rewards than in material or financial rewards." GEOGRAPHY: 15,007 square kilometers (slightly larger than Connecticut) of mountainous terrain at the southeast end of the Malay Archipelago north of Australia. DEMOGRAPHCS: Population estimated at 830,000 to 1 million, predominantly Catholic with small Muslim, Protestant and animist minorities. TRANSACTIONS: Official languages are Tetun and Portuguese; currency is the U.S. dollar. 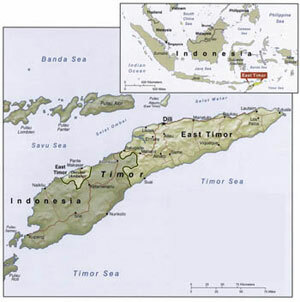 HISTORY: Colonized from the 1600s and divided in 1755 with Portugal claiming the eastern part of Timor. Three centuries of localized revolts followed. Japan invaded in 1942, battling with Australian guerilla fighters. Portugal reasserted political control after the war, but business was dominated by the Chinese. Rebellions continued, giving rise to the Timor Liberation Front and Nobel Peace Prize winner Jos� Ramos-Horta. Indonesia invaded soon after Portugal’s 1975 withdrawal. After Indonesian dictator Suharto’s 1998 ouster, the East Timorese rejected Indonesian rule in a UN-sponsored referendum. 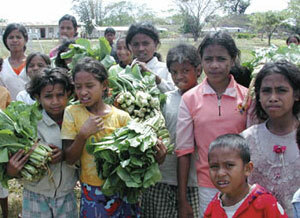 Thousands were killed or displaced in retaliatory violence by Indonesian military forces and East Timor militia groups. The UN set up a transitional administration in 1999, and Timor-Leste was officially recognized as an independent nation on May 20, 2002. ISSUES: Land and maritime boundary disagreements with Indonesia and Australia; disputed rights to petroleum resources; high rates of poverty and illiteracy and 50 percent underemployment. Sources: East Timor: The World's Newest Country, a UH Mānoa Center for Southeast Asian Studies pdf curriculum and the World Factbook website.